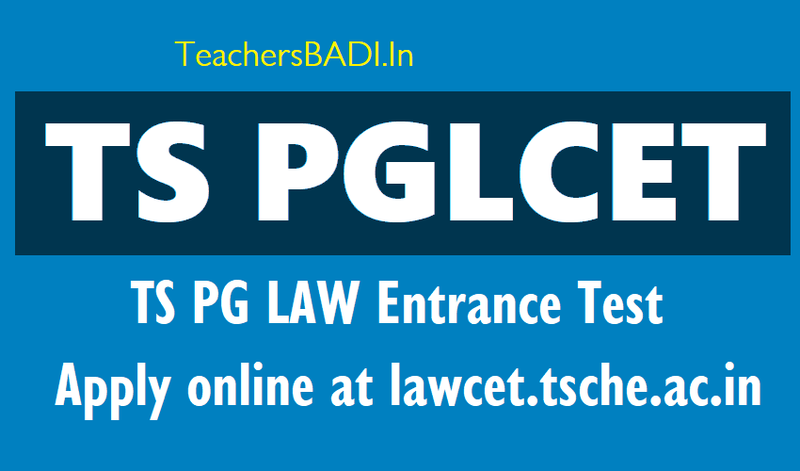 TS PGLCET 2019| Telangana PG LAWCET 2019 Apply online at lawcet.tsche.ac.in. #TS #PGLAWCET 2019: Kakatiya University, Warangal, Telangana State has issued the Post Graduate Law Common Entrance Test(PGLCET) 2019 in the month of March 2019. This entrance test for entry into first year LL.M Regular and Self Financing Courses in the Colleges of Law in Telangana state for the academic year 2019-2020. The PGLCET will be conducted by the Convenor, Department of Law, Kakatiya University, Warangal on behalf of Telangana State Council of Higher Education(TSCHE), Hyderabad. This Post Graduate LAWCET 2019 will be held on ../05/2019. The University will invite the Online Applications from eligible Candidates for admission into first year LL.M courses offered by state Universities in Telangana State including their Affiliated Colleges. తెలంగాణ రాష్ట్రంలోని న్యాయ విద్యాకళాశాలల్లో ప్రవేశాల కోసం నిర్వహించే టీఎస్‌ లాసెట్‌ (తెలంగాణ రాష్ట్ర లా కామన్ ఎంట్రెన్స్ టెస్ట్), పీజీ ఎల్‌సెట్‌ షెడ్యూల్‌ ఖరారైంది. మార్చి 10న లాసెట్‌, పీజీఎల్‌సెట్‌ నోటిఫికేషన్లు విడుదల కానున్నాయి. మార్చి 15 నుంచి ఏప్రిల్‌ 25 వరకు ఆన్‌లైన్‌లో దరఖాస్తులను స్వీకరించనున్నారు. ఆలస్యరుసుముతో మే 16 వరకు దరఖాస్తులను స్వీకరిస్తారు. TSLAWCET/ TSPGLCET-2019: TS Law Common Entrance Test (TS LAWCET-2019) for admission into 3/5 years law courses (LL.B) and TS PG Law Common Entrance Test (TS PGLCET-2019) for admission into LL.M courses offered by state Universities in Telangana State including their affiliated colleges for the academic year 2019-20 will be conducted by Osmania University, Hyderabad. 3 year LL.B Course- Any Graduate Degree. 5 Year LL.B. Course- Intermediate Examination. LL.M- LL.B./ B.L. How to Apply: Candidates may apply through online mode only from 15.03.2019 to 25.04.2018. Date of Entrance Test: 20.05.2019.
b) The Candidates seeking admission into LL.M. (Private Appearance) of Osmania University, Hyderabad shall have a minimum experience of 3-years as a judicial officer or 3-years standing as an advocate on the date of appearing for PGLCET 2019. Candidates can apply through online mode. Candidates who wish to apply for Telangana LAWCET 2019 are requested to fill the particulars carefully in ONLINE APPLICATION. The required information should be collected from the relevant documents. The lawcet key is to be released on today but so far not released. From the beginning it is a mess. For the first four days the fee uploading was wrong n aspirants have to apply again by paying fees. As many as 6 qs are wrongly framed in pglawcet. The day October release of key is not adhered to. Very sorry state of affairs indeed.